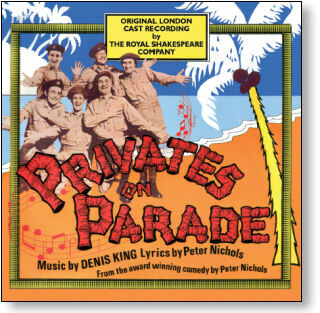 'Privates On Parade' is an award winning musical comedy written by Peter Nichols with music by Denis King. The plot focuses on the activities and exploits of the fictional Song And Dance Unit South East Asia (SADUSEA) who are stationed in Singapore and Malaysia during the late 1940s. The production was first staged by the RSC at Stratford before transferring to London's Aldwych Theatre in February 1977 where it went on to win The 1977 Laurence Olivier Award for "Comedy Of The Year". The production also earned Oliviers for its leading performers Denis Quilley (Comedy Performance of the Year) and Nigel Hawthorne (Actor of the Year in a Supporting Role) with Michael Blakemore also being nominated for Best Director. The production was also honoured at the 1977 Ivor Novello Awards as 'Best Musical'. The award winning and critically acclaimed production later transferred to the Piccadilly Theatre in 1978 before debuting in the United States in 1979. Peter Nichols later adapted 'Privates On Parade' for a 1982 feature film starring John Cleese and Denis Quilley, reprising his role as the cross dressing Captain Terri Dennis. 'Privates On Parade' is regularly revived, most recently at the Noel Coward Theatre as part of the Michael Grandage Season in 2012/2013. The Original London Cast album, recorded in January 1978, makes its debut on CD and has been digitally remastered from the original master tapes. All tracks licensed from Bucks Music. With special thanks to Denis King.